In this respect Powell’s choice of films is extremely interesting. Some of the movies discussed have long been crying out for a Deleuzian analysis, including Meshes of the Afternoon (Maya Deren and Alexander Hammid, 1943), The Trip (Roger Corman, 1967), 2001: A Space Odyssey (Stanley Kubrick, 1968), Requiem for a Dream (Darren Aronofsky, 2000), Donnie Darko (Richard Kelly, 2001) and assorted works by Stan Brakhage and David Lynch. At points as I read Powell’s book I fancied I heard the sound of several PhDs being hastily rewritten to accommodate these long-awaited breakthroughs! However, in terms of films discussed there are some more important interventions, such as Powell’s reclamation of Alfred Hitchcock’s Spellbound (1945) from the rigour-mortised clutches of traditional, psychoanalytic approaches. Indeed, although my heart initially sank when I saw that a discussion of Strange Days (Kathryn Bigelow, 1995) had been included (a film already covered from a Deleuzian perspective by both Kennedy in Deleuze and Cinema and Pisters in The Matrix of Visual Culture), Powell’s engagement with the film ultimately provides a very valuable, albeit brief, development of the work of these predecessors. Something similar could be said of her analysis of Werner Herzog’s Heart of Glass (1976), which Powell approaches in order to uncover exactly why Deleuze referred to it in passing as presenting “the greatest crystal-images in the history of cinema” (4). Along with Ronald Bogue’s Deleuze on Cinema (5), then, Deleuze, Altered States and Film also continues the unpacking of Deleuze’s ideas in relation to the art films on which Deleuze originally based his findings, through the rigorous, sustained textual analysis expected by the field of Film Studies, but unfortunately missing from Cinema 1 and Cinema 2 (6). In other important respects, Powell’s position within Film Studies informs her re-interpretations of Deleuze’s work, ensuring that information and ideas flow productively back across the same “mixed plane of film-philosophy” (p. 5) that Deleuze’s philosophy encountered in the 1980s. For instance, in Chapter Two, whilst analysing the bad trip scene from Easy Rider (Dennis Hopper, 1969), Powell re-figures Deleuze’s idea of a cinematic camera-consciousness as the “camera’s intoxicated consciousness” (p. 72). This cine-philosophical innovation is discussed in relation to the extensive use of a fish-eye lens in this sequence, a technological instrument which has “no human parallel” (p. 73) even though it has by now become a cliché in representations of drug-induced altered states. Again, when examining Requiem for a Dream in the same chapter, Powell discusses the Snorri-cam (a camera “attached to the actor’s body, keeping it in focus while blurring the background” [p. 75]) and its blurring of boundaries between subject and object, and actual and virtual. In these respects, the technologically informed discipline of Film Studies is able to further develop Deleuze’s innovative philosophical consideration of cinema, and to simultaneously reclaim the use of Deleuze within the discipline from cynical accusations of philoso-babble. Yet this is not solely a book for subject specialists. Deleuze, Altered States and Film is written in a very clear, transparent style and expresses complex ideas in a mature, seasoned manner with due consideration for the reader. Powell’s introduction in particular engages the reader in a personal manner without being chummy, inviting us to view the text almost as a theoretical guidebook to the films that just happens to use Deleuze as its chosen interpretive tool. This, along with Powell’s rigorous dedication to clearly introducing and explaining Deleuze’s concepts, makes this a very good book for both a general readership, and for use in university teaching. Although it is most apparently indebted to Kennedy’s Deleuze and Cinema, and (as one would expect) it builds upon Powell’s previous work, Deleuze and Horror Film, in this instance the focus is not limited to one genre, ensuring a far more expansive and groundbreaking engagement with the field. The major feature of the book is an exploration of the event of film viewing as an altered state. This emphasis on the spectator’s bodily experience of cinema is its most apparent strength, offering an alternate perspective to the ocular emphasis of so much film theory since 1970s Screen theory. This approach further solidifies the increasingly dominant trajectory of those studies (such as Shaviro, Kennedy and Pisters) to focus on the physically affective potentials for understanding cinema offered by Deleuze’s philosophy. Indeed, in this respect Powell’s work is particularly valuable because it derives as much from her engagement with Deleuze and Guattari’s work as it does from Deleuze’s two cinema books. Yet this major strength of Deleuze, Altered States and Film also raises the most intriguing of questions surrounding its conclusions. Can (and indeed, should) an examination of cinematic sensation and affect escape the subjective experience of the critic? Is it possible for a film theorist to “convey a sense of each film as a singular encounter” (p. 5) without recourse to a purely subjective point of view? Powell acknowledges this conundrum in the introduction, when she discusses her own particular tastes, calls for “a more creative style of interpretation than some ‘transparent’ scholarly ideal” (p. 13) and states that the reader should “[r]ead my speculative responses alongside your first viewing (or fresh re-viewing) of the films being explored.” (p. 13) Thus Powell’s own subjective experience of the films in question is never far from the surface throughout. For instance, in Chapter Three she discusses her own personal experience of seeing the experimental film The Flicker (Tony Conrad, 1965) at a full-sized screening (as opposed to on a television-sized screen), and those of her companions. This section in particular tacitly highlights the potential range of subjectively defined sensations and affects that may be experienced by various viewers watching films in different settings. Admittedly, this line of reasoning might seem a little churlish. After all, we are dealing with a major paradigm shift here, introduced by Deleuze, in which cinema is considered for its ability to influence more than just the eye of the beholder. The ramifications of this approach are not insignificant, after all, and influence the way in which we understand identity in the media-saturated twenty-first century. Even so, it is worth investigating the ramifications of this approach in more depth. The potential danger with this type of analysis is that, whilst it offers us another perspective to the ideologically driven analysis of theories like Screen theory, it may at times ignore the content-specific politics of the image. Thus, whilst Powell attempts to reclaim Requiem for a Dream from negative criticism of its content by examining its engagement of the audience through sensation and affect, her conclusions do not altogether address these existing criticisms. How exactly does the cinematic experience of addiction or delirium, which she convincingly theorises, exist in relation to the film’s rather grotesque depiction of an existentially horrific view of life for which it is often criticised? If we follow Powell’s path then we may find a welcome increase in the degree of relativism that can potentially exist within film theory. On the other hand, we may well lose some of our existing concern for the shared issues pertaining to representation, such as the effect, and affect, of ideology on film content and form. This is a factor of great importance in a discipline still dominated by context-specific, historical studies of national cinemas. Here again, whilst Powell’s analysis of the affective power of the movement- and time-image elements of Donnie Darko is excellent in itself, she does not link this to a consideration of the film’s content. What can we conclude from this film about US suburbanites who supported the election of George Bush Sr, in a context where schoolteachers are fired for not towing a very conservative line in the classroom, and which concludes with a renunciation of the schizophrenic possibilities offered by alternative universes? Is it possible to align analysis of formal construction and the affect it has on the spectator with the film’s ideological content? Put another way, what is the ideological affect of cinema? That said, it is worth remembering that the most important feature of Deleuze, Altered States and Film is that it opens up this very question. As the above discussion illustrates, there is obviously more work to be done in this area in the future. Ultimately, as no one author can be expected to do everything in a single book, this remains an extremely well-timed and influential intervention into the field. 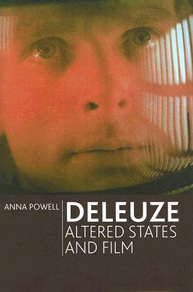 Deleuze, Altered States and Film, by Anna Powell, Edinburgh University Press, Edinburgh, 2007. Steven Shaviro, The Cinematic Body, University of Minnesota Press, Minneapolis, 1993; D.N. Rodowick, Gilles Deleuze’s Time Machine, Duke University Press, Durham and London, 1997. Anna Powell, Deleuze and Horror Film, Edinburgh University Press, Edinburgh, 2005. Shaviro, The Cinematic Body; Barbara Kennedy, Deleuze and Cinema, Edinburgh University Press, Edinburgh, 2000; Patricia Pisters, The Matrix of Visual Culture: Working with Deleuze in Film Theory, Stanford University Press, Stanford, 2003; David Martin-Jones, Deleuze, Cinema and National Identity, Edinburgh University Press, Edinburgh, 2006. Gilles Deleuze, Cinema 2: The Time-Image, The Athlone Press, London, 1989 , p. 75. Ronald Bogue, Deleuze on Cinema, Routledge, London, 2003. Deleuze, Cinema 1: The Movement-Image, The Athlone Press, London, 1986 ; Deleuze, Cinema 2. David Martin-Jones lectures in Film Studies at the University of St Andrews, Scotland. He is the author of Deleuze, Cinema and National Identity (Edinburgh University Press, 2006).